Following the success of the Bright Crystal edition, Versace has launched an even stronger version of the original scent in the hope that it will thrill all the fans. Of course, there had been many demands asking for such product. The fans of the Bright Crystal edition particularly love the original, but feel that the perfume can be improved with better projection and longevity. The result, Versace Bright Crystal Absolu was born. It is quite similar to the original, but there are also notable distinctions – the excellent longevity being the most prominent character. Just like what mentioned above, the creative director of Versace, Donatella Versace, describes this perfume as a fragrance that has enhanced intensity and longevity, featuring a composition that delivers vibrant love. 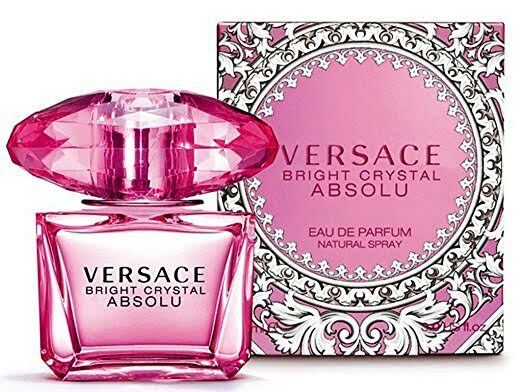 Versace Bright Crystal Absolu is actually produced by Versace by partnering with Euroitalia. Meanwhile, the fragrance itself was crafted and designed by the perfumer Alberto Morillas, the same name behind the Bright Crystal EDT, Versace Yellow Diamond, and Versace Pour Homme. The face on the advertising campaign is Candice Swanepoel, dressed in a glittery evening gown on a luxurious sofa while holding a bottle of Versace Bright Crystal Absolu in her hand. This perfume was launched in 2013. Versace Bright Crystal Absolu comes with a similar flacon design as the original. It has a rectangular shape, but the cap has an enlarged size and is shaped like a gem. However, compared to the original, the flacon of Versace Bright Crystal Absolu indeed has a darker pink hue. The darker theme color may indicate that this is the more intense and stronger version of the original. Meanwhile, the outside packaging comes in the form of a box, also in a pink color, but with an elegant white decoration. Versace Bright Crystal Absolu has a very loveable scent. It is best described as a sweet and floral scent. Of course, the most dominant notes of the scent are sweet floral notes, but it is also enhanced by fruity and citrusy notes, creating such as fresh and captivating atmosphere. This scent is suitable for the spring and summer seasons, and as a day wear rather than a night wear. Versace Bright Crystal Absolu opens with a fresh fruity opening. The top notes consist of pomegranate, yuzu, and cold watery notes. It is fresh and chilling. Then, the heart notes are introduced, featuring raspberry, peony, lotus, and magnolia. Here, the floral notes are strong and prominent, but the raspberry helps to balance things out to prevent the fragrance going too monotone and intoxicating. Meanwhile, the base notes consist of amber, musk, and mahogany. The combination here is woodsy and warm, though not very prominent in the overall scent. Indeed, Versace Bright Crystal Absolu is stronger than the original, but do not expect something heavy. Versace Bright Crystal Absolu is more of a moderate sillage. The projection is just perfect and balanced, nothing too heavy or too weak. But the best thing about the fragrance is the longevity. Versace Bright Crystal Absolu is a long lasting fragrance. Every application can last for over seven hours, making it a solid choice for daily wear. Check the best price of Versace Bright Crystal Absolu here!